Due to a "DIY project gone wrong" a few years ago we need to replace some bathroom cabinets in our teensy bathroom. To enhance the visual space of the current open floor space (a mere 5' by 2.75') I'm looking for some space saving options. 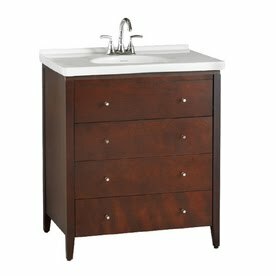 Compact - This Massina vanity has a very small footprint at 24" x 22" x 34.6" and would free up more space than our existing standard size vanity. Clutter Free - It maximizes storage to keep visual-space-hogging clutter at bay with its three drawers. Small Sink - Unfortunately, it might be difficult for users who wash their hair in the sink or for filling up buckets for mopping. Raised profile - The sink has a raised profile meaning caulk is needed and cleaning more challenging. Size - Unknown other than 30" across. Single piece sink - This aides in cleaning and provides a sense of visual openness. Open to floor - The legs give the illusion of more space in the bathroom. Storage - Two functional drawers provide significant efficient and usable space to keep clutter out of sight. 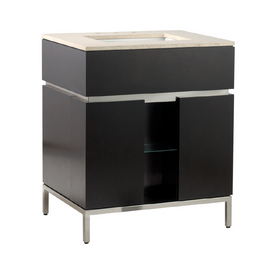 Thin Profile - This Baria Vanity has an even smaller footprint at 23.5" x 18" x 34". Open to floor - The visual space underneath the vanity adds more sense of space as well. Continuous surface sink - The single inlaid sink means there is no visible caulking or profiles to struggle to clean. Skinny sink - But the thinner sink would make it even more difficult for users who wash their hair in the sink or for filling up mop buckets with water. 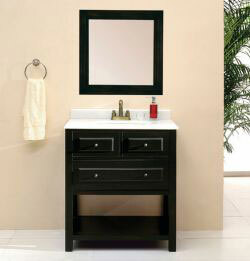 Standard Size - This vanity is standard size (30' x 21.5' x 33.25') but offers some other space saving benefits. One piece sink - This makes cleaning much easier. Eliminate need for step stool - With the pull out step stool on the bottom it could save tons of space by eliminating the need for additional step stools in the bathroom. 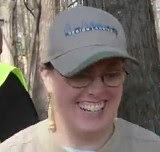 This one can be hidden out of sight when not in use. Not quite tall enough - Unfortunately, I don't think this step stool is nearly tall enough to accommodate our shortest user! 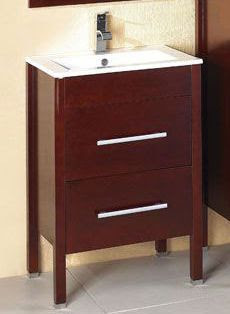 Standard size - This vanity is also standard size (30' x 21' x 33.25') but offers other space saving benefits. Serious storage - The amount of usable storage space is incredible. There are three usable drawers which are generally more efficient that doors anyway. Open to floor - With the feet at the bottom it also enhances the sense of space because of the openness. 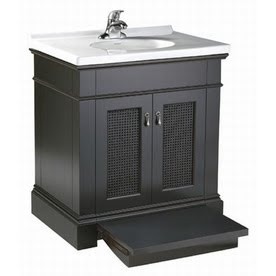 Standard size - This studio style vanity is only slightly smaller 30" x 22" x 35" than standard size but has other space saving benefits. Open to floor - The visual space created underneath the vanity gives the illusion of more space in the bathroom. Linear design - The horizontal lines can also add the illusion of space by moving the eyes across the space. Single piece sink - This low profile sink makes for easy clean-up and minimizes the amount of vertical space used. Small doors - The small door size means there is less space needed for the doors when opened. Clutter potential - The two door rather than drawer design provides less optimal storage and could create "clutter" sight lines with the open concept in the middle. Standard Size - At 30' x 21' x 34' this is standard size but does offer other space saving benefits. Openness - Not only does this provide open space underneath the legs, there is also an open shelf below the drawer. 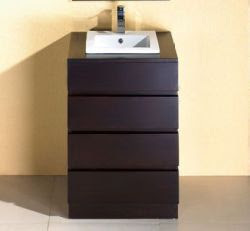 This gives the illusion that the vanity takes up considerably less space. Single piece sink - This provides easy clean up and does not provide the vertical visual distraction that a top mount sink creates. Clutter potential - There is only one drawer which could suffice for some toiletries. Depending on how the bottom shelf is used for additional storage it could contribute to the creation of visually distracting clutter.